No matter the occasion, Pedal Party NW provides a fun way to celebrate birthdays, bachelorettes and more. Photo credit: Lorraine Wilde. Brought to bike-friendly downtown Bellingham in May 2015 by long-time residents Amy and Tom Lawson, Pedal Party NW has been entertaining tourists and helping locals celebrate birthdays, bachelorettes, and business with their state-of-the-art 10- to 15-person-bicycle. I recently took a very memorable ride on one of Bellingham’s newest attractions. The Lawsons have been married for almost 34 years, having lived and worked in Whatcom County for decades. Amy taught high school science at Squalicum High School for 19 of her 20 years with Bellingham Public Schools, recently retiring in June 2016. “I’m enjoying learning new things through the business,” says Amy of her role as booking and communications agent. “What I love about it is that everyone is always so happy and satisfied.” Tom has worked as a builder in the area with his company Compass Woodworks for more than 40 years. Pedal Party NW is currently Tom’s pre-retirement hobby. Co-owner Tom Lawson hands out water to help patrons stay hydrated during their trip while answering technical questions about the inner bike’s inner workings. Photo credit: Lorraine Wilde. “We also could do it without having to buy into a franchise,” adds Amy. 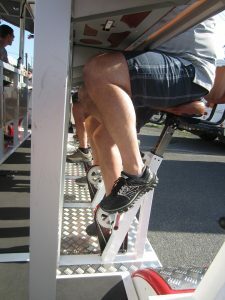 Ten pedalers are needed to move the bike along, although batteries assist when hills are too steep. Photo credit: Lorraine Wilde. 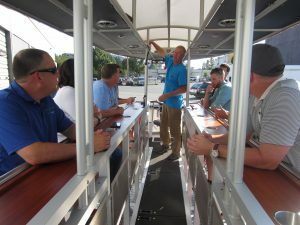 I recently took a ride with the employees of a locally-owned supplier of building materials that has operated in Whatcom County since 1992, Bellingham Millwork Supply Company. The Pedal Party NW trip was given to Millwork employees by the sales representatives of Tacoma-based treated wood supplier McFarland-Cascade as a thank you gift for their long-time business partnership. On our trip, we listened to classic rock piped into the bicycle’s 6-speaker sound system from the phone of a Millworks employee. “The party can have a custom soundtrack chosen by the group,” explains Tom, who considers this bicycle one of the most high-tech multi-person bicycles available in the country. “There is a computer that senses speed and kicks in with electric-assist when needed to get up hills that are tougher than our pedalers,” says Tom. Up to 10 people can pedal at any one time, and it travels at a safe top speed of 7 miles per hour. The padded seats are adjustable and have a back cushion for added comfort. 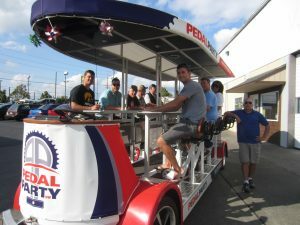 There are non-pedaling seats for five additional passengers plus the licensed driver provided by Pedal Party NW to steer, guide, and park this specialized vehicle. 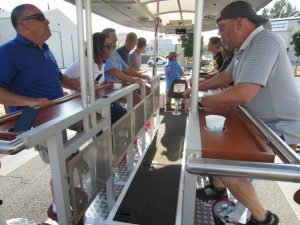 The bicycle also has overhead storage for purses and bags, plus holders for water cups offered by Pedal Party NW employees to encourage responsible continued hydration throughout the trip. “We’ve also been able to accommodate some patrons in wheelchairs and of almost any age, including the Whatcom Family YMCA’s Pedaling for Parkinson’s group, so there are very few limits to who can ride along,” adds Amy. Employees of Bellingham Millwork and McFarland Cascade pedal to their first stop at downtown’s The Local. Photo credit: Lorraine Wilde. On my ride along, Millworks employees decided among themselves where they’d like to stop on their 2-hour trip. Most trips include two to three stops at almost any downtown Bellingham location within biking distance of their headquarters near the intersection of Meador Street and North State Street. The stops are only limited by time and the group’s willingness and ability to pedal. For obvious reasons, businesses at higher elevations are less popular destinations. Stops common on Pedal Party NW tours include Bellingham’s award-winning breweries and Mallard Ice Cream. “Some groups want to spend time and get food while others want to get in three stops, but it’s really up to them,” explains Amy. Our tour took us first to The Local for microbrew beers and a couple games of table shuffleboard. Then the group pedaled to Schweinhaus Biergarten for some outdoor enjoyment of comfort food —sausage on kraut, Bavarian pretzels, and locally-brewed beer — before pedaling back to the Meador Street headquarters. Scheduling a party is simple. Patrons can contact Amy via phone or e-mail to select a date. Party attendees meet at the Meador Street location, sign a standard insurance waiver, and then depart at the scheduled time. The party returns to Meador Street at the end of each trip. 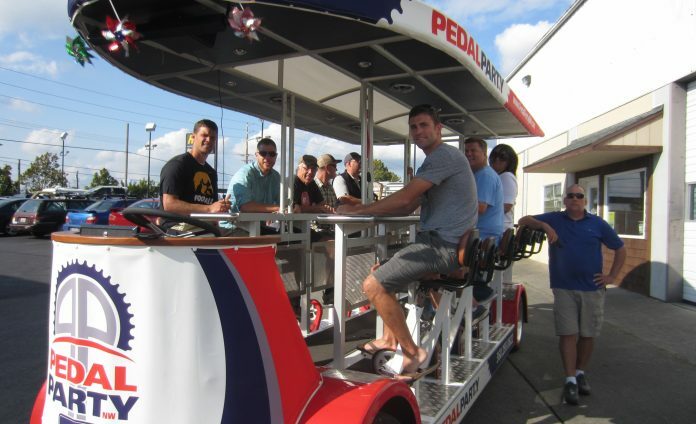 Pedal Party NW can usually accommodate up to four or five 2-hour trips in a single day, charging batteries overnight. Bachelorettes and businesses alike benefit from Pedal Party NW. Photo credit: Lorraine Wilde. Pedal Party NW has also donated discounted trips to local charities including a Whatcom Humane Society auction prize that raised over $1200. Business is doing well enough for Amy and Tom to donate about six discounted trips each year. No matter what the occasion, taking a ride with Pedal Party NW is a unique, unforgettable way to get some fresh air and exercise, explore Bellingham’s downtown businesses, and celebrate with friends or colleagues.